New LIVE coaching session starting March 5th! Click HERE to learn more about the program and how to sign up! I joined this group 2 years into TSW and I wasn’t sure what exactly I would gain from being here because I did as much research as I could going to practitioners, and doing things on my own but I was still suffering. I had seen little victories here and there but I needed something more. Surprisingly, I learned a lot of little things here and there from the modules and from people sharing on the live coaching calls. Implementing those small changes was a very big push into my healing journey. I’m finally seeing clear results that I haven’t seen in the last 2 – 2 1/2 years! I think it’s an awesome tool for anyone in any stage of their TSW journey. I thought I read every possible blog post to see what other things that I might be missing in my regimen but I’m really glad that I decided to join to be able to get to know Abby and Jen and all the people struggling with me. Just knowing there are other people going through the same struggle is comforting and empowering and knowing that we are rooting each other on as we’re all trying to get to the same goal. We have a “shared trauma” that helps us all to get through. Before this program I would research so much, and learn things on my own like avoiding certain foods, and doing certain things that would be good for the skin, but the biggest thing that helped was realizing how powerful your mindset is in the healing process. Using affirmations, and including your mind in the healing process really helped. That is something that I would not have known to look into on my own. When I’m looking at my skin I can now visualize what it will be like when it’s healed! From joining the program I find the most helpful thing for me is being able to talk to other people in similar positions. I find that to be the biggest help because you know that you’re not alone going through it and that there are others feeling, thinking and experiencing the same things. Also how you all have recommended all natural stuff, I think that’s so important. When I would have recommendations from Abby and Jen, I haven’t hesitated to go ahead and try them because I didn’t have to worry about side effects. I find you all so encouraging and I definitely want to thank you for that! 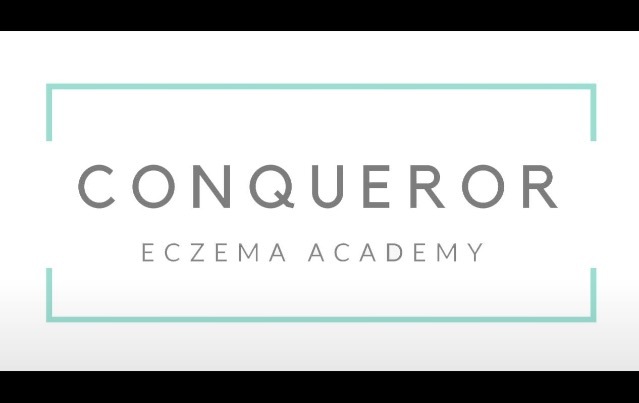 Abby and Jen’s Conqueror Eczema Academy was really helpful with my journey going through life with eczema. I joined the group to help me take it to another level, to really be focused on it because doing it on my own I cheat here and there and using the groups it helped me to stay on track and it was motivational being on the group calls. I like how responsive Abby and Jen were, anytime we needed information they would put themselves readily available for us, answering any questions and concerns we may have. They did a good job guiding us into which direction in changing our lifestyle for the better. It’s not just the eczema, it’s just a symptom of what’s going on inside of our bodies. They are very informative of what needs to be done to cleanse our bodies and detox, to pretty much overall change our lifestyle and health. I’m really appreciative of these 8-weeks that I’ve gone through and I’ve learned a lot from the both of these coaches and it’s really set a lifestyle change for me to be motivated and to keep up the work. It’s given me a lot of guidance in terms of the right direction for my health. I’m happy that I’ve joined and I’m sure that anyone who joins this will find a lot of benefit from the coaches Abby and Jen. Abby and Jen’s programme offered great support to help me get through difficult times in my journey towards better health and skin. It gave me the confidence to know that I am doing down the right path and to stay consistent in the actions I am taking to clear my eczema.